New York, NY (November 6, 2014) – Madison Square Garden Entertainment announced today that music icon and Garden Franchise Billy Joel has added a record-breaking 13th show at Madison Square Garden on Friday, January 9, 2015 as part of the Time Warner Cable Concert Series. In 2006, Joel set a Madison Square Garden record by becoming the first solo artist to sell out 12 consecutive shows in a single run, a feat memorialized by the raising of a banner dedicated to the legendary performer. Tickets for the January 9th show go on sale on Friday, November 14, 2014 at 10AM. The January 9th show marks Joel’s 13th consecutive show at MSG since he embarked on his franchise run and his 59th overall performance at Madison Square Garden. The MSG record is currently held by Elton John for “most number of performances by any artist” at 64 performances. Citi cardmembers will have exclusive access to presale tickets beginning Monday, November 10, 2014 at 10AM via www.citiprivatepass.com. Tickets for the record-breaking show will be available for purchase by the general public beginning at 10AM (EST) on Friday, November 14, 2014 via ticketmaster.com and by calling Ticketmaster at 866-858-0008. Tickets will also be available at the Madison Square Garden box office on November 15, 2014. Prices range from $64.50 to $124.50. 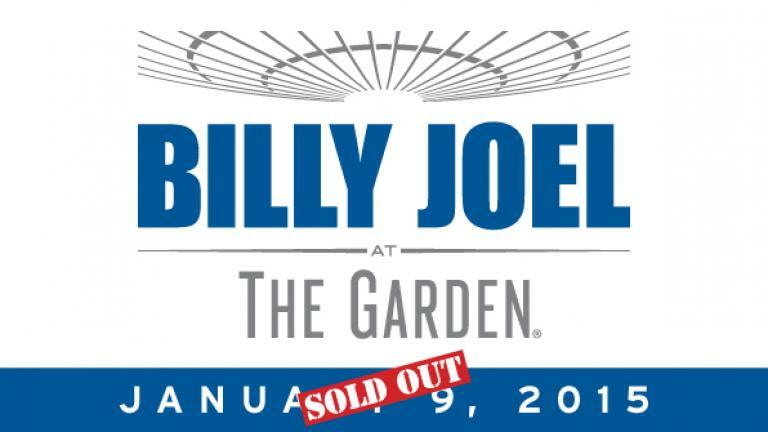 All 12 previously announced shows as part of the Billy Joel’s franchise run have sold out. The concerts are being promoted by MSG Entertainment in association with AEG Live and Q104.3 as a media partner. To celebrate the franchise, MSG Network will debut “Billy Joel Home at The Garden” – a half-hour special capturing the first year of Joel’s groundbreaking franchise run at Madison Square Garden with behind-the-scenes footage, interviews, and unforgettable moments from his performances – on Monday, November 10 at 11:00 p.m. immediately following the Knicks home game against the Atlanta Hawks. “Billy Joel Home at The Garden” will also air on Tuesday, November 11 at 10:30 p.m. following the Rangers home game against the Pittsburgh Penguins. In December 2013, Madison Square Garden announced Billy Joel as the first-ever music franchise of The World’s Most Famous Arena joining the ranks of The Garden’s other original franchises – including the New York Knicks, Rangers and Liberty. Having sold 150 million records over the past quarter century, Billy Joel ranks as one of most popular recording artists and respected entertainers in history. The singer/songwriter/composer is the sixth best-selling recording artist of all time, the third best-selling solo artist and is one of the highest grossing touring artists in the world. This month, Billy Joel will receive both The Library of Congress Gershwin Prize for Popular Song which honors living musical artists’ lifetime achievement in promoting the genre of song as a vehicle of cultural understanding; entertaining and informing audiences; and inspiring new generations, and the once-in-a-century ASCAP Centennial Award, which is presented to American music icons in recognition of their incomparable accomplishments in their respective music genres and beyond. In December 2013, Joel received The Kennedy Center Honors, one of the United States' top cultural awards. He is also the recipient of six GRAMMY® Awards, including the prestigious Grammy Legend Award. Joel has been inducted into the Songwriter’s Hall of Fame and the Rock and Roll Hall of Fame and has received numerous industry awards. “Movin' Out,” a Broadway musical based on Joel’s music choreographed and directed by Twyla Tharp, took home two Tony Awards, including Best Orchestrations – Joel’s first Tony Award win – and Best Choreography. For his accomplishments as a musician and as a humanitarian, Joel was honored as the 2002 MusiCares Person Of TheYear by the MusiCares Foundation and the National Academy of Recording Arts & Sciences. Joel has also performed alongside other music greats at two of Madison Square Garden’s most extraordinary benefit concerts – “12-12-12, The Concert For Sandy Relief,” which raised awareness and money for those affected by Hurricane Sandy and “The Concert for New York City,” which was held to help aid 9/11 victims and heroes. Billy Joel received a star on the Hollywood Walk of Fame in Los Angeles, adding another milestone to his extraordinary career.